Mrs Mari/Mary Edwards (1819-92) was the paternal grandmother of Mrs Nesta Wyn Evans (the wife of the Archdruid Wil Ifan), who owned this photograph. 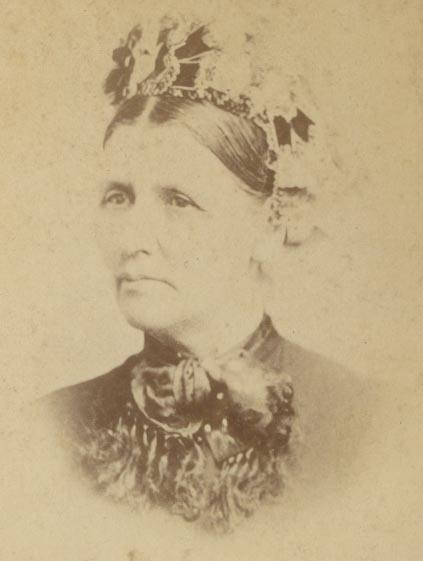 She was born on 15 July 1819, the ‘daughter of John Ellis Clogwynau in the parish of Dolgelley by Lowry his wife’ [née Williams], and baptised on 1 August the same year at the Hen Gapel, Dolgellau. On 19 December 1840, in St Mary’s Church, Dolgellau, she married Richard Edwards (1815-61), a son of Edward Howel (1766-1829) and Mari/Mary Hugh(es) (1777-1848) of Esgairgawr, Llanfachreth. Richard, who then lived at Caecoch, Llanuwchllyn, subsequently became a saddler in Dolgellau, where he and his family lived at Ivy Court, Lombard Street. The oldest son to survive to adulthood was John (1849-1918), who had a saddlery and ironmongery business in Eldon Square, Dolgellau, and became prominent in local government, serving as a Poor Rate Collector and Sanitary Inspector and acting as a town councillor. His younger brother Richard (1857-1933), a carpenter and builder in Dolgellau, also worked for the Town Council as a surveyor. John, a keen Congregationalist, was a leading member of the group who were asked to establish the English Congregational Church in the town in 1878. He married Catherine/Kate Jones at Capel Rhydymain, Llanfachreth, on 27 May 1882. Their eldest daughter was Nesta Wyn (1883-1968), who graduated from Aberystwyth in history, and taught at Dr Williams’ School in Dolgellau and at Llangollen County School, before marrying Rev. William Evans (Wil Ifan), whose first pastorate, from 1906 to 1908, was the Dolgellau English Congregational Church. John and Catherine’s son, Aneurin John Glyn (known as Glyn) (1886-1943), was a Classics graduate who worked as a government Inspector of Factories before becoming a barrister in Cardiff: he stood for Parliament (unsuccessfully) as a Liberal candidate on various occasions, including two General Elections (Cardiff Central, 1924; Burnley, 1929). John and Catherine’s younger daughter Keridwen became a doctor, winning a Robert Liston Medal for surgery at University College Hospital in London in 1920, and married another doctor, John Vincent Armstrong, but was killed on 29 January 1941 when Brook Hospital, where they were both working, was bombed in the London Blitz. Richard and Mary Edwards were buried in St. Mary’s Churchyard, Dolgellau. There are many later family memorials at Rhydymain: John and Catherine Edwards and their infant son Richard Glyn (1884-1884); Aneurin John Glyn Edwards; Keridwen St. Valentine Armstrong and her friend Winifred Porter, a fellow doctor who was killed with her; and Nesta Wyn Evans and her husband, Wil Ifan.